Looking for Pinterest-worthy dreamcatchers and pretty floral tiaras? Pune-based startup, Bloomwreath is making dreams come true with their collection of everything bright, young and flowery. 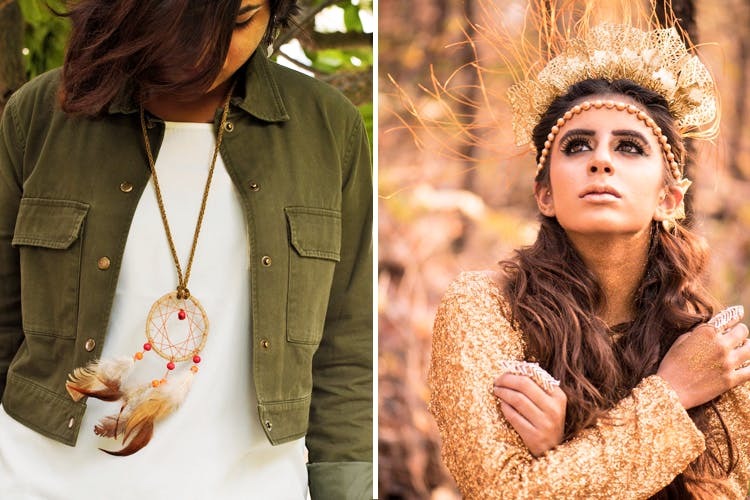 Brainchild of Aishwaryaa Satam, Bloomwreath collection of handmade dreamcatchers in multi-hued feathers and adorable trinkets, will bound to turn million heads. The dreamcatchers are customised to perfection and come in varied sizes- from a conceptualized pendant dreamcatcher to wear around your neck to a bookmark-shaped dreamcatcher and a beautiful bird caged dreamcatcher to hang on wall. Priced between INR 90 and INR 850, these creative pieces are not just unique, but designed carefully with intricate patterns. Besides dreamcatchers, Aishwaryaa also spends a lot of time on making the most elegant floral crowns and tiaras for her clients. One of her best works is perhaps the project she took up for designers Adhisa Ghosh & Nikita Mishra. The collection featured royal dream-like head gears made with roses, orchids, lavandula and more. Priced between INR 190 and INR 650, the simple yet graceful floral tiaras for you and your cute pets, are one of the bestsellers of Bloomwreath. If you loved their collection, contact Aishwaryaa at +918554834829 and place your orders. Aishwaryaa does quite a lot of pop-ups in the city, so make sure you follow Bloomwreath on Facebook and Instagram for the update.